For centuries, the Rocky Mountains have captivated humans with their jagged peaks, magnificent waterfalls, and serene alpine lakes. However, millions of years ago visitors to this area would have been greeted with a drastically different view, as hundreds of feet of ice blanketed this land. When these glaciers that once dominated Colorado retreated, they created the awe-inspiring landscapes we revel in today. 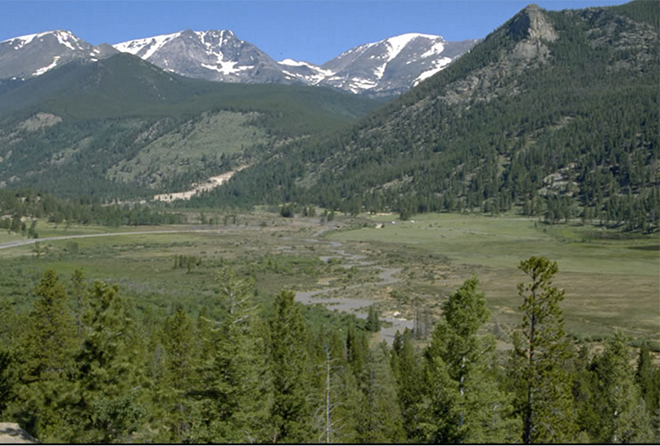 To travel back in time 80 million years and learn more about the forces that shaped Rocky Mountain National Park, join the Rocky Mountain Conservancy-Field Institute on August 19th for "Vanishing Ice: An Ice-Age History of Rocky Mountain National Park". Doctor Jason Janke, a professor of Earth and Atmospheric Science at Metropolitan State University of Denver, will be leading an educational expedition through Rocky Mountain National Park to uncover the park's glacial history. Participants will also have the opportunity to assist with a research project examining permafrost and freeze-thaw patterns. Whether you are new to geology or are a seasoned glaciologist, "Vanishing Ice: an Ice-Age History of Rocky Mountain National Park" is sure to be an exciting and educational adventure for all involved! For more information on the course, call the Rocky Mountain Conservancy-Field Institute at (970) 586-3262, or visit http://rmconservancy.org.